A beautiful art installation; pray they’re not programmed to play Stairway to Heaven. 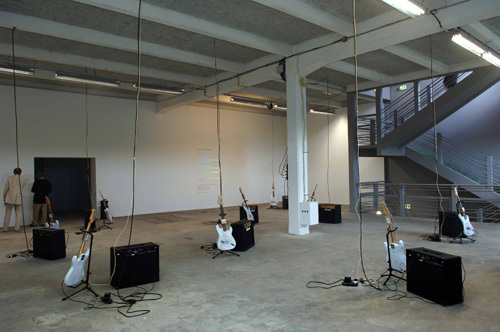 Saadane Afif’s Power Chords, view of the installation at the Lyon Biennial 2005. Image by Galerie Michel Rein. …works with notions of displacement and contrast. His pieces, vibrating with multiple meanings, function by using collusion as their driving force. He employs objects, scale models, installations, sounds, and writing to classify the unclassifiable and mirror-in the work of art itself – the dialog that arises between the viewer and the artist. This dialog is continuously fueled by various allusions and is infiltrated on every side by historic, psychological, social, and cultural elements. It always has to be about displacement, doesn’t it? Always has to be the dialog between viewer and event? Darned art writers. Anyway, in plain English he puts 13 guitars in a room and they play mysterious, ethereal strumming sounds as you walk through, a bit like a minimalist haunted Guitar Center. It’s not just the guitars: he’s made his other work into musical installation. Lyrics is a radically different take on the artist retrospective: the artist is gone, and instead digital music reinterpreting his work takes its place. Lyrics are printed in bold Helvetica on the walls, and commissioned texts are reinterpreted by commissioned composers, as colored lights lead the audience around to headphones. Lyrics are transformed into art objects, too; the music plays on headphones. 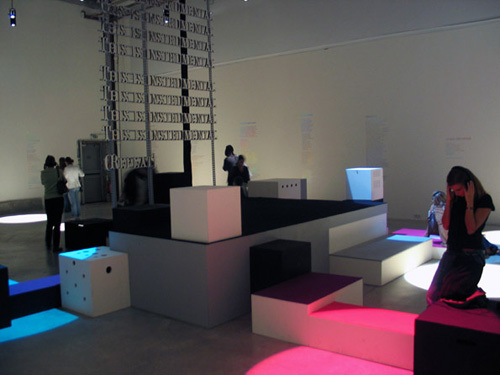 Lyrics, installation view, Palais de Tokyo, Paris2005. Image by Galerie Michel Rein. Good stuff, and fertile ground for those imagining new venues for music. Now, excuse me; my phone is vibrating with multiple meanings.